After spending way too much time mowing, I knew exactly what I wanted for my snack: Edwards Hot Apple Crisp with Creamy Ice Cream. 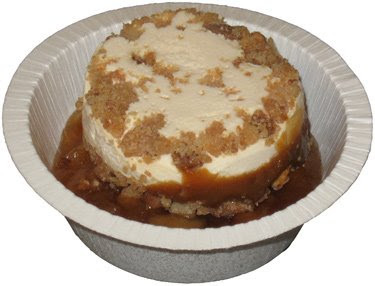 The exact description is a Cinnamon Apple bowl with an almond crumb & caramel topped ice cream cup. Just like before, you heat up the bowl and then plop on the ice cream. Simple, yet effective, and enjoyable. The toasty warm apples hit the spot but dominate the entire treat. You just don't really taste, well think, about anything else. The ice cream is there, and it adds a nice hot/cold contrast, but this is an apple treat, not an ice cream treat. I also couldn't tell if an aftertaste was starting to build up there at the end. Overall I say it's good but not fantastic. I think it's a worthy treat to have in freezer in case the mood hits you for a hot apple treat.